Sony and Samsung have both attempted to make the tablet more portable at this year’s IFA. The Sony Tablet P features two displays and folds away when not in use whilst the Samsung Galaxy Note has a more traditional single-display design. Tablets are great for consuming multimedia: the large display makes them ideal for viewing photos, videos, browsing the web and playing touch-based games such as Angry Birds and Cut the Rope. With 3G connectivity on your tablet, it’s possible to use your tablet on-the-go but many people prefer not to carry around such a large device: tablets lack one of the key benefits of a smartphone which is the ability to fit it in your pocket (“pocketability”). At this year’s IFA exhibition, Sony and Samsung unveiled devices which they hope to make the tablet experience more portable. The more novel tablet comes from Sony. 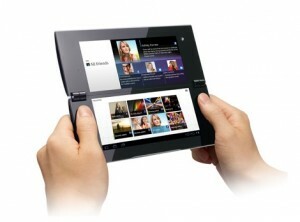 The Sony Tablet P features two 5.5-inch displays in a clamshell form factor which closes when not in use. Combined, the two displays give the equivalent of a 7-inch display. The tablet can be folded up when not in use making it more pocketable than a normal tablet. Each display has a resolution of 1024×480 giving a combined total resolution of 1024×960. Samsung’s Galaxy Note has a more traditional design. Featuring just a single display, it packs a 5.3-inch display and ensures pocketability by being much smaller than a typical tablet. In an attempt to bring the tablet experience to a smaller screen, the Galaxy Note’s display has a high resolution display with 1280×800 pixels. This is higher resolution than what is offered by many tablets: the iPad 2 has a resolution of 1024×768 even though it features a 9.7-inch display. In this article, we review both approaches to building a more portable tablet. 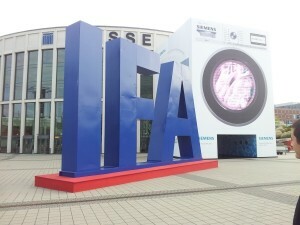 Ken’s Tech Tips should thank the hospitality of Samsung Electronics at the IFA: please see the full disclosure notice. The Sony Tablet P has two displays. 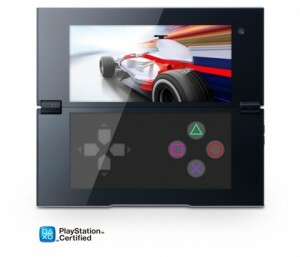 The Sony Tablet P is a dual-screen tablet. The device features a clamshell design with two 5.5-inch displays. When not in use, the device folds up and can be carried around in a pocket or handbag. When the device is opened, the two 5.5-inch displays can work together to give the equivalent of a 7-inch display. Whilst we felt Sony’s folding tablet was a great idea in principle, we were entirely underwhelmed with the device and disappointed with it’s execution. The primary problem with the device is the large bezel around the Tablet P’s two displays: not only is there a large gap between the edge of the display and the edge of the device, there is also a large black gap between the two displays too. This makes it very awkward to use whenever you’re viewing content such as webpages, maps or photos across both displays: there’s a huge black gap right across the middle of your screen. For maps, photos and videos, the most important information tends to be situated at the centre of the screen. To be fair to Sony, they’ve realised that photos and videos don’t look great with a black bar through the middle. When using the Gallery application and Video player, the default mode is only to use the top display for content and the bottom display for navigational controls (e.g. to navigate through an album or to seek through a video). However, this means the content you want to view is now confined to being on a single 5.5-inch display. In our opinion, this means the second screen is essentially “wasted”. When you pay for a tablet you expect to be able to use up the entire of the display to view the content you want to view: things such as navigation and playback controls should get out of the way when they’re not needed. Having an entire display for playback controls is a wasteful way to use up valuable screen real estate. No other tablet in the world would normally dedicate half of the screen real estate for playback controls indicating this is a non-ideal interface forced by the Tablet P’s folding design. In many parts of the device, an entire display is dedicated to navigation or playback controls. This is not always ideal e.g. when viewing long videos where the controls will seldom be needed. The bezel between the two screens needs to go. If such a prominent bezel exists, consumers are never going to consider the two displays as if they are parts of one large display. People won’t want to consume multimedia on such a device either: the most important region in a photo or video is the part in the middle and that’s where the black bar sits and ruins the viewing experience. We’d prefer to see a mechanism where one of the screens lies on the outside of the device when closed. A slider mechanism similar to that used on the HTC Desire Z would allow consumers to expand the device so that both displays can be used. When closed the device would act like a single-screen smartphone and when open the device would act more like a dual-screen tablet. The ability to multi-task using the two displays. If I’ve got a video running on one of the displays, why shouldn’t I be able to browse the web on the other display? It’d be a lot more useful than useless playback controls. As it stands, we feel that the Sony Tablet P has some major design flaws and gives few of the benefits that we associate with the tablet form factor. The Samsung Galaxy Note features a 5.3-inch display with tablet resolutions. The Samsung Galaxy Note is Samsung’s smartphone-tablet hybrid device. It’s less of a risky proposition than Sony’s dual-screen tablet: it only features a single screen like most of the smartphones and tablets we’ve been used to in the past. 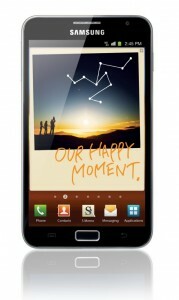 Featuring a 5.3-inch display, the Samsung Galaxy Note is physically much closer in size to a smartphone than a tablet. 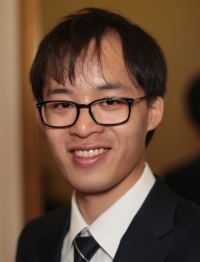 For comparison, the iPhone 4 features a 3.5-inch display whilst top Android smartphones such as the Samsung Galaxy S II and HTC Sensation feature a 4.3-inch display. According to Samsung, 5.3-inches is the largest sized display which will ensure “primary device portability” or “pocketability”. Although the Galaxy Note has a smaller display than most tablets, the resolution of the display matches that of many tablets. The Galaxy Note features a 1280×800 display: the same resolution offered on Samsung’s 10.1-inch Galaxy Tab. The Apple iPad 2 features a 1024×768 resolution on a 9.7-inch display. With a smaller display and higher resolution than the iPad 2, the Galaxy Note has a much higher pixel density than the iPad 2 and hence much sharper image quality. Whilst the Galaxy Note’s display certainly gives a good multimedia viewing experience, its certainly a product of compromises. The ideal smartphone would probably be smaller than 5.3-inches and the ideal tablet would be larger than 5.3-inches. Even with it’s high resolution screen, a 5.3-inch display might not be as good as a 10-inch display for watching long movies on your tablet. Sony and Samsung have both made good attempts at building a more portable and pocketable tablet with their “Tablet P” and “Galaxy Note” devices. Whilst Sony takes the riskier approach of adopting a two-display foldable tablet, Samsung’s more straightforward approach of a one-display device is clearly more practical and more usable. The Galaxy Note’s form factor is less alien to consumers and the inclusion of just one display means the device is much slimmer and pocketable than Sony’s (the Galaxy Note is 9.65mm thick whilst the Sony Tab is 26mm when folded). On paper, the Tablet P should feature more space for multimedia content when considering both displays together: however the black bar through the centre of the Tablet P’s display means realistically the actual usable screen space for multimedia is barely better on the Galaxy Note. At the IFA, Sony and Samsung displayed two different approaches to a more portable tablet offering. Ultimately the demand for a larger display on a pocketable tablet can only be satisfied by some kind of folding mechanism like that implemented by the Sony Tablet P: otherwise the display size will always be limited by the size of your pocket. At the moment, Samsung’s Galaxy Note takes the more successful approach of packing as many pixels as possible into a single display. 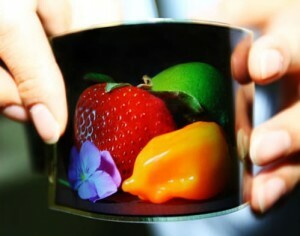 In the future, the demand for larger displays on a pocketable tablet could be fulfilled by flexible organic LED displays. This could allow even tablets with large displays to be pocketable. Perhaps at IFA this time next year? Disclosure Notice: I was hosted in Berlin by Samsung Electronics, the manufacturer of the Samsung Galaxy Note. The views expressed in this article are totally my own and reflect solely my own views and experiences of using the devices mentioned. We'd love to hear your thoughts and any questions you may have. You can add your own comment here. Mobile Internet: How Many Gigabytes of Data Do You Need? Your Smartphone's SIM Card Size: Standard, Micro or Nano? My passion is helping people to get the most out of their mobile phone. I've been blogging at Ken's Tech Tips since 2005. Aside from writing about mobile technology, I have an interest in software development, digital marketing and physics. Outside of the blog, I work with numerous technology companies helping them to market their product to consumers. Find out more.